Up to 30% Off Habitat at Sainsbury's - Plus Extra 10% with Discount Code Shop the Habitat sale where you can save up to 30% as well as another 10% with this code! Delivery Pass from £10 at Sainsbury's Save up to £126 per year with a wonderful delivery pass available at Sainsbury's from just £10. 25% Off Selected Groceries at Sainsbury's Find 25% off a great selection of groceries at Sainsbury's. Up to 25% Off Selected Baby and Toddler Products at Sainsbury's Brilliant savings on everything you need for your little ones at Sainsbury's. Big Night in Essentials from £1 at Sainsbury's - Including Snacks, Entertainment and More Who doesn't love a cosy night in with a film and your favourite snacks? Free Click & Collect on Orders Over £40 at Sainsbury's Fancy a bit of convenience? 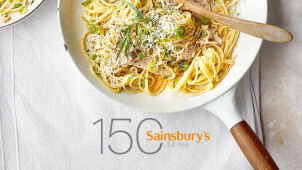 Enjoy free click and collect at Sainsbury's when you spend £40 or more. Find Over 200 Vegan Products from 45p at Sainsbury's Embrace the power of plants with a brilliant range of Vegan treats and essentials from as little as 45p at Sainsbury's. Sainsbury’s first started life in Victorian London as a dairy shop using milk from farms in Devon and Dorset to produce what was to be known as ‘the nation’s best butter’. The store was so successful that John James Sainsbury was able to expand the business first throughout London and later, in the 1930’s, into areas of the Midlands. Sainsbury’s now has 1,200 stores nationwide, from local convenience stores to big superstores, which supply consumers with everything from groceries and alcohol, right down to lifestyle goods. Sainsbury’s continues to focus on its values and proves that doing the best for its customer is always at the heart of any decisions made. Speaking of alcohol, Vouchercloud has actually taken a look at how Sainsburys compares to the other supermarkets in terms of prices - more specifically, gin prices and prosecco prices. Sainsburys actually have a pretty nice pricing structure for gin, in case you're curious and/or thirsty! There are many different outposts to Sainsbury’s from its clothing range and bank through to being a leading energy supplier. Its numerous partnerships with other leading brands and online stores means that customers can make huge savings with their nectar points and Sainsbury’s discount codes can also be used to save money on grocery items or deliveries. Doing the weekly food shop has never been easier and the click and collect service can save you delivery charges on bulky items. On top of all this the Sainsbury’s website has tons of advice from healthy recipes for the whole family to hints and tips on how you can live well for less. How do I use my Sainsburys vouchers? Choose the Vouchercloud offer you want to use for your visit to Sainsbury’s. Click on 'View Deal' to get your voucher or ‘Get Code’ to get your discount code. Use your code when you purchase items online. Some deals don’t require a code so follow the on-screen instructions and continue to the website. Some vouchers may need to be used in store. Print out your discount voucher or save it on your smartphone if you don't have access to a printer. You can earn bonus Nectar points by registering your nectar card with My Coupons and selecting 5 of your favourite coupons. These will then be loaded to your Nectar card and bonus Nectar points will be added to your account automatically. Where can I find information about my nearest Sainsbury’s store? The quickest and easiest way to find your nearest store, including information on facilities, services and opening hours, is to use the Store Locator. Once you have found your chosen store, click on the name of the store and ‘more information’ to view all the relevant information about that store. How do I cancel or change my online order? You can change or cancel your order by logging into your account and selecting ‘My Orders’. You will have until 11pm on the day before your scheduled delivery to do so. You can also amend or cancel your order on the Sainsbury’s app. Where and when can I collect my Click and Collect Grocery Order? When placing your order on the website you will be asked to select a time slot that suits you. You can then choose the nearest store that offers the Click and Collect service and pick up your order from the Click and Collect zone in the car park of the chosen store. There is a minimum order value of £25 for any grocery order. Orders up to £40 will be charged a maximum delivery of £7. Orders over £40 will be charged a delivery fee between £1 and £7. Orders over £100 will be delivered FREE when booked for delivery between Mon and Thur, after 2pm. You can find out further information on the Sainsbury's website here. You are able to exchange and return items within 30 days of purchase if it's in original condition and with proof of purchase. Get more info here. Use the Store Locator to find your local Sainsbury's and to see its opening hours. For great quality products at competitive prices, Sainsbury’s is a great place to do the family shop and find all of your groceries. Sainsbury’s believes in sustainability and supporting British suppliers, why not do your bit too by enjoying UK sourced and quality products for less with our Sainsbury’s vouchers? From food, to clothing like the Tu range, and even household goods and furniture - update your home and lifestyle without spending a fortune. Sainsbury’s has arguably one of the best reward schemes out of all the big supermarket chains with its Nectar card. Not only can the points you collect help you get money off your next shop they can also be swapped for treats elsewhere such as a coffee at Café Nero or even a holiday with Expedia! Another great bonus to the Nectar card is that points can be collected when you shop with other online retailers like Argos or EasyJet; all you need to do is make your purchase via the Nectar website. In 1986, Sainsbury’s became the first supermarket to sell organic produce to consumers. The Sainsbury’s SO Organic range now stocks over 250 products including fruit and vegetables, meats such as chicken and beef through to dairy products like milk and cheese. Shop organic and save on your lamb joint, roast chicken, organic veggies and all the rest using our Sainsbury's discount code to ensure that you're buying into quality. All of the SO Organic products are sourced from the UK, ensuring British farmers and producers are supported and consumers know exactly where their food comes from.